There was a time when men were men and horses weren't lasagna. 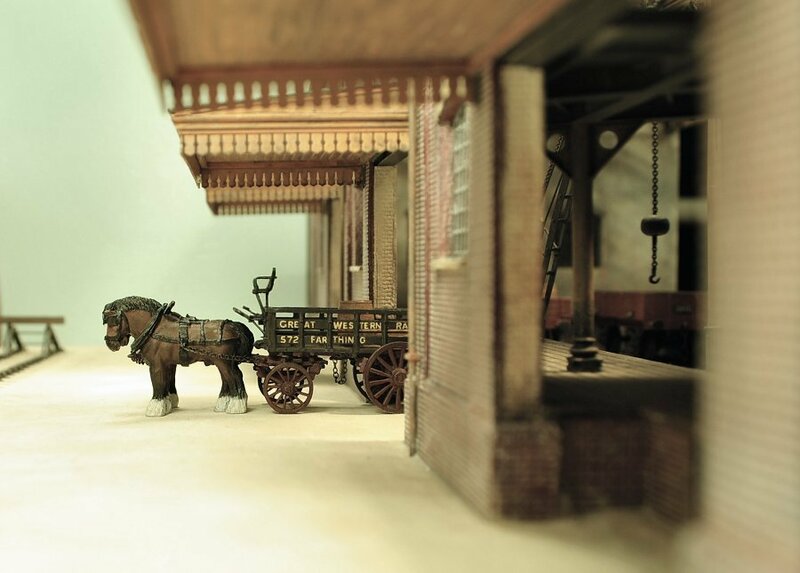 I’m currently building some horse-drawn vehicles for the little yard behind my goods depot. 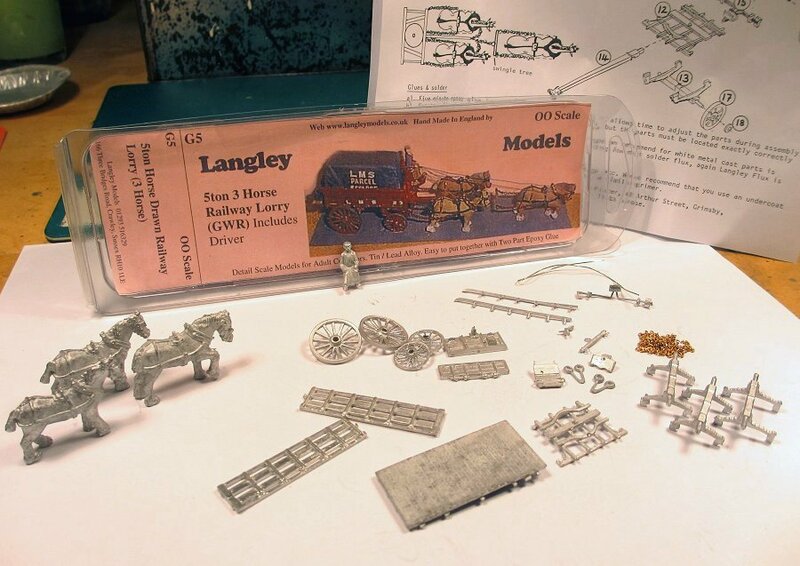 I began with Langley’s whitemetal kit for a GWR 5 ton wagon. This represents one of the standard designs often seen in photos from pre-grouping days, especially in the London division. It should be said at once that it isn't a finescale kit - indeed it's a bit rough in places. But with a little work I thought it would be OK for a position in the middle-ground of this little layout. Above is the kit as supplied. At 20£ this is no cheap kit, though I imagine the three horses and carter are part of the reason. There is little flash, but most parts do need a bit of filing and tweaking to make a good fit. The instructions are reasonable, although some details of the assembly are left to the imagination. To improve appearances, I filed thick bits down to a leaner shape. I added rails between the side boards, and used wire in drilled holes to secure items (as per photo above). I compromised on the stanchions that support the raves: These are moulded as solid triangles, but replacing them is not really practical, I think. In primer. The seating arrangement follows the elevated 'Paddington' pattern (as opposed to the much more basic 'Birmingham' style). The parts provided for this looked overscale to me, so I basically rebuilt the whole seating arrangement. 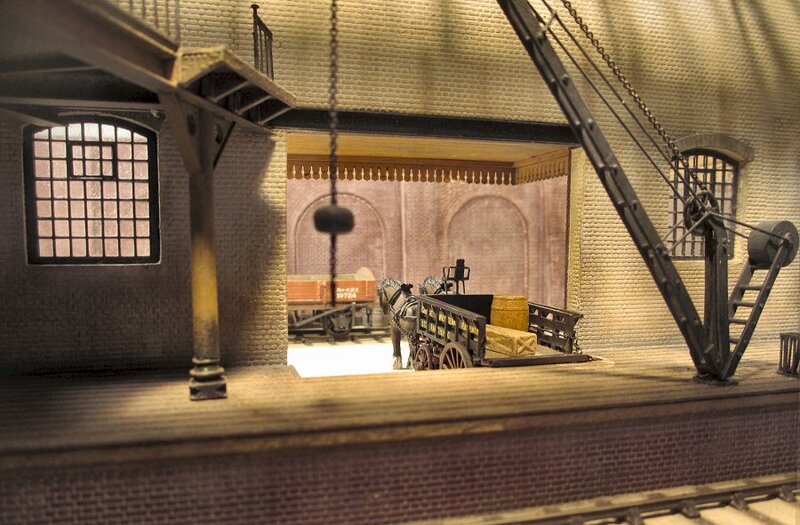 The fore carriage was fitted in a way that allowed it to actually pivot. There are shire horses and then there are shire horses! The one on the left came with the kit along with two others. The one on the right is from Dart castings. I opted for two of the latter. I replaced the supplied chain with something finer. 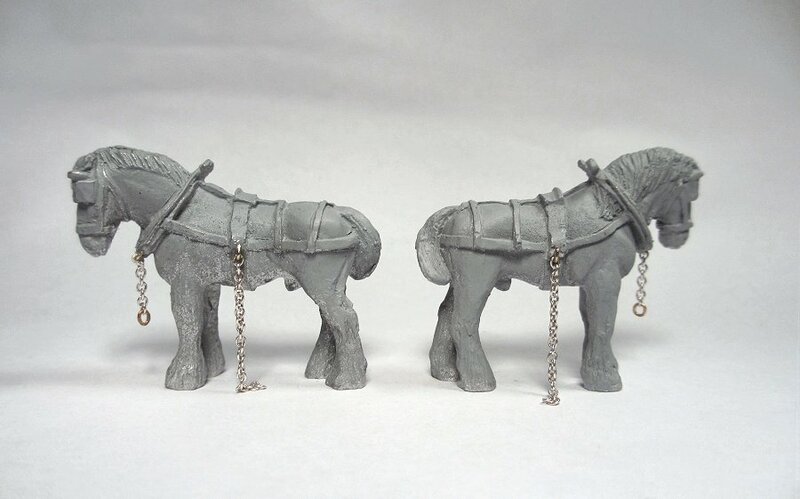 To fit the chains to the horses, I sunk bits of wire into the beasts, fitted the chain and then bent the wire to form a small loop. For the lettering, I needed yellow letters. There are no ready-made transfers available for these vehicles, so I plundered the HMRS GWR goods wagons sheet, building up the wording letter by letter. The spacing to accommodate the framing was also seen on the prototypes, although it is accentuated here due to the thicker castings. The HMRS sheet does have yellow letters, but not enough for my purposes, so as an experiment I used white letters and coloured them afterwards with a yellow marker. I wouldn’t really recommend this – it works OK at first but you have to be very careful with the subsequent varnishing or it will take the colour right off. I’m not entirely happy with the lettering, but life is short. Done. The chain in the middle is a rough indication of the chains and skids used for locking and braking the wheels when parked. I do like the 'osses. 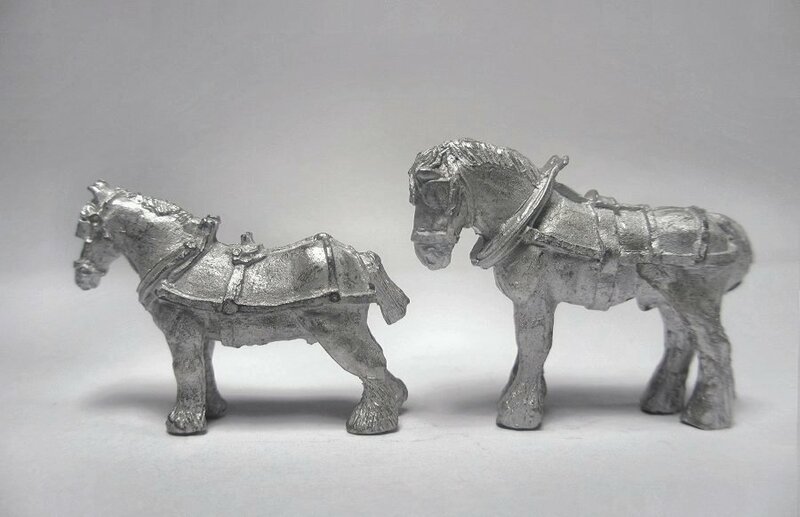 In the last year or so Dart Castings have added some very useful horses to their range, including these. In position in one of the cartage bays. Although one or two details don't stand close inspection on this vehicle, I am reasonably satisfied with the overall outline and feel of it. The wagon seen from inside the depot. Not sure what to add in terms of load. It is tempting to do one of the sky-high loads seen in some photos (eg here), but I think it might become visually over-powering on this vehicle. Maybe on the next one. 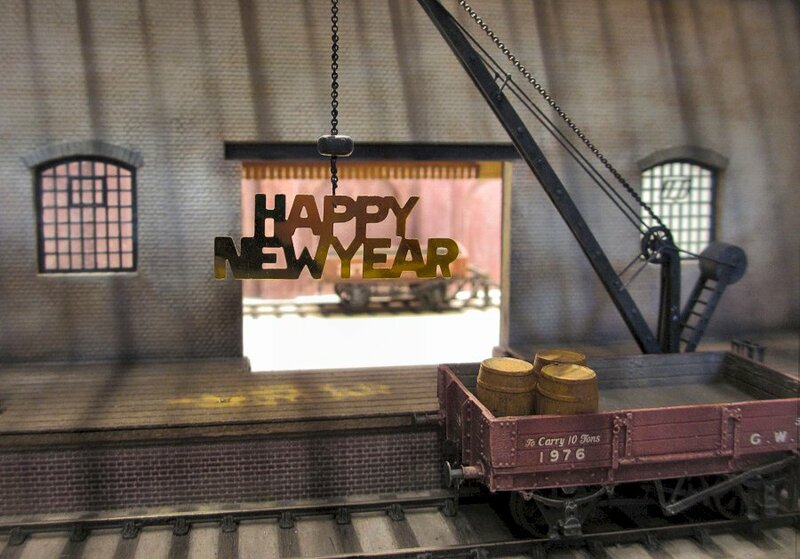 Off-topic: It looks like some of the decorations from New Year's eve have made it into my goods depot. Happy New Year to everyone! For what it’s worth, I’ve added here some of my own notes on these vehicles. Note that they are mainly based on my own observations from photos and drawings. I do have "Great Western Road Vehicles" by P. Kelley, but despite some useful illustrations, this book does not really go into much written detail on the horse-drawn wagons. Perhaps 'Great Western Horse Power' by Janet Russell is better, and worth a purchase? 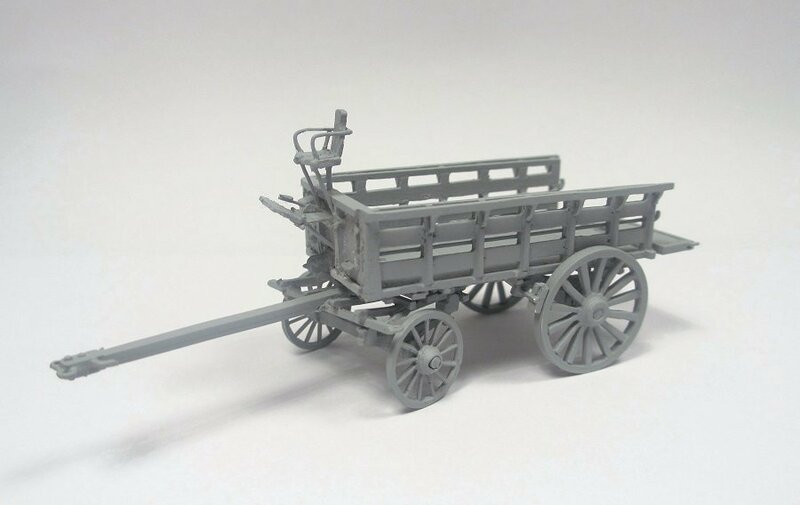 These wagons were used for standard and heavy goods cartage. There were different types built to this style, some with six “bays”, some with five. Some were built for a single horse, some for two or more. The tare and tonnage varied considerably across the different designs. They had the “Paddington pattern” of seat arrangement, where the seat was elevated above the wagon. Hoops could be fitted to accommodate sheeting. A light version of the same design was used for parcels delivery vans, with hard tops. The wagons were especially prominent at Paddington, where photos suggest they were the all-dominant type in the 1900s. However they were also used elsewhere on the system (even as far as Cardiff, according to one drawing). In some areas they seem to have been rare though, eg at Birmingham Hockley the dominant goods delivery wagon was of a quite different design. A photo from Slough in the 1920s shows the type I have modelled alongside one of the Birmingham style vehicles, so different types they did appear together at some locations. 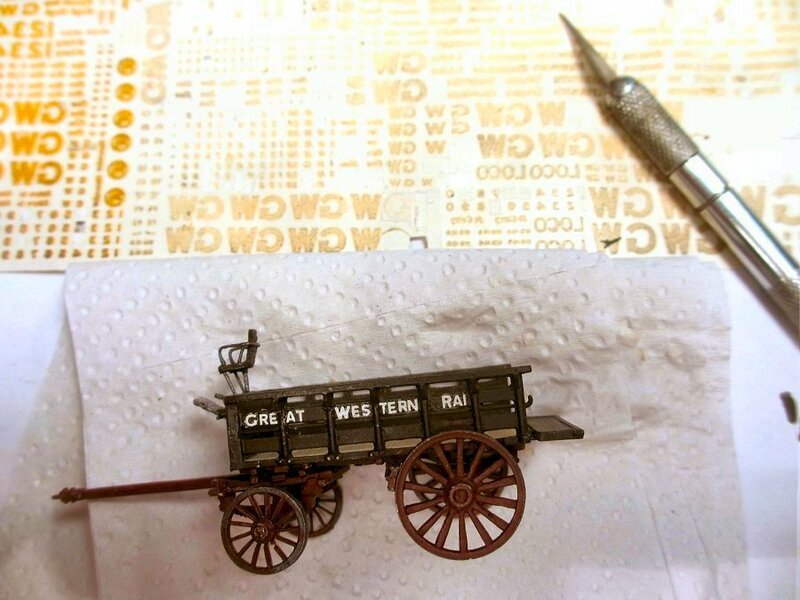 In Great Western Way (original edition), Slinn states that by the 1900s, station names were applied to larger horse-drawn vehicles whenever there was room for it (as seen on my model above). I have a theory, though, that this practice ended sometime after 1905 or thereabouts: Looking at photos after that date, station names are no longer present, and the 'Great Western Railway' and numbering is all on one plank. Slinn also states that numbering was in random positions, but as far as I can see the numbers on these vehicles were always at the front end of the wagon. Perhaps Slinn missed the fact that the relative position of the lettering and numbers was necessarily “handed”, because we read from left to right (ie on the left hand side, it would be written '667 Great Western Railway' and on the right hand side, it would be 'Great Western Railway 667'). According to Slinn, the lettering for horse-drawn vehicles in the 1900s was yellow or gold, shaded or not. 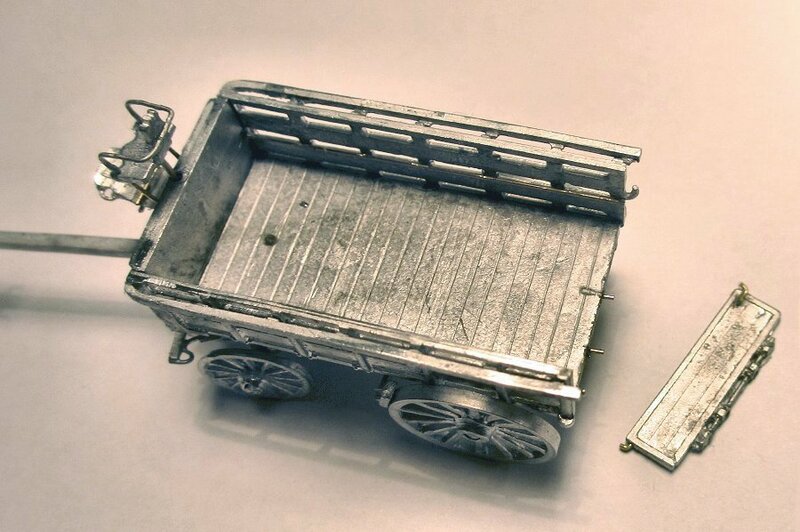 I doubt gold would have been used for wagons like these, and there is no apparent shading in the photos I have seen. So presumably plain yellow (but the shade of yellow not clear?). I have sometimes wondered whether the lettering was in fact white on some wagons, because it stands out with very high contrast in some photos. 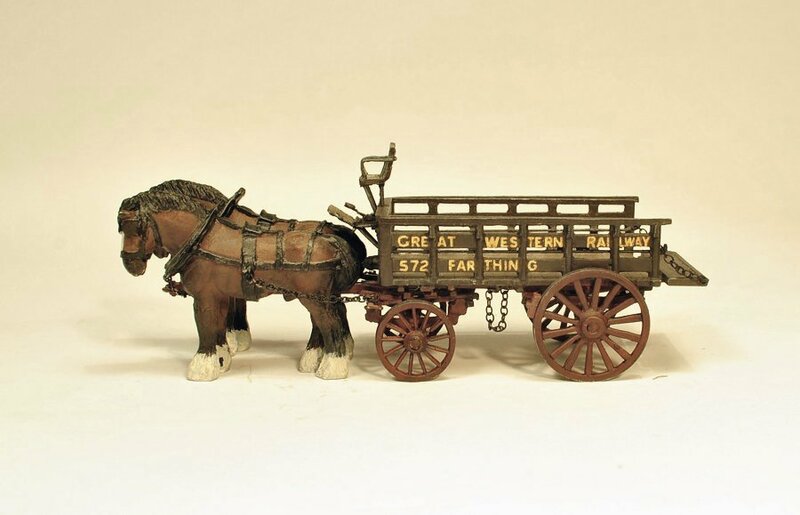 However, looking at photos of parcels vans (which are known to have had white letters on their hard tops) it seems that the letters on wagons were darker than white, so presumably yellow. 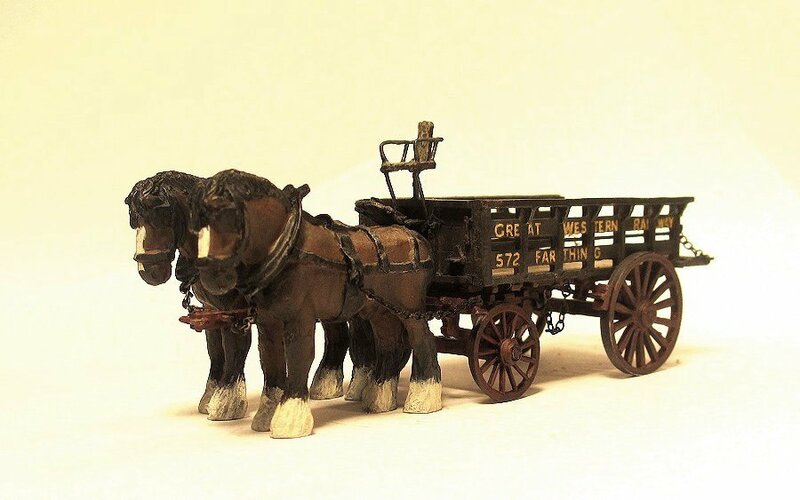 Later in the 1930s, horse-drawn vehicles adopted a different chocolate and cream livery and a different lettering style.